Wild or cultivated, members of the genus Primula, or primroses, have been popular for centuries. The genus is part of the Primulaceae family, which also contains cyclamen and lysimachia. There are over 400 primula species, native mostly to the Northern Hemisphere. The plants are perennial and are distinguished by their rosettes of basal leaves that often look lettuce-like. The five petals of each flower are joined at the base and individual blooms or clusters of blooms appear on leafless stalks. Various primrose species sport blossoms in an array of colors, including white, cream, yellow, red, blue and blue-purple. Some species and varieties also bear bi-colored flowers. 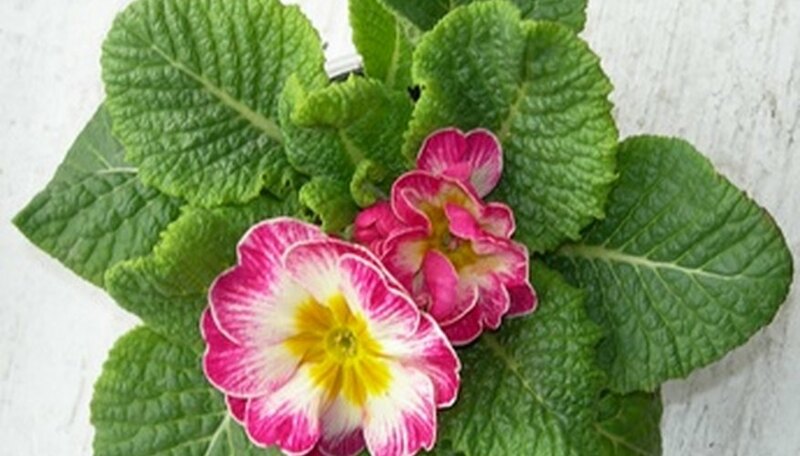 Primrose flowers have a host of symbolic, medicinal and culinary meanings. The pendant flowers of the cowslip, Primula veris, were sometimes called "Key Flower" in England because they were thought to resemble a hanging bunch of keys. The association with keys may also have led to another common name, "Herb Peter," because the symbol of St. Peter is a bunch of keys. Ancient Norse peoples celebrated this primrose as a symbol of the goddess Freya, known as the "Key Virgin." In traditional herbal medicine, cowslip wine, made from P. veris, was used as a sedative. When the flowers were boiled with sugar to make a syrup, the concoction was used to treat palsy as well as nervousness. The juice of the flowers, either used alone or combined with other ingredients into an ointment, was supposed to be effective at treating facial spots and wrinkles. Primrose flowers have long been favored by poets and writers. Shakespeare refers to the cosmetic properties of the flowers in "A Midsummer Night's Dream." Poet John Donne wrote "The Primrose," equating the flower with womanhood. In the 19th century, Samuel Taylor Coleridge wrote the poem "To a Primrose." The flowers of some primroses, especially Primula vulgaris, are edible. They can be eaten raw in salads or as an edible garnish, and can also be made into conserves (preserves). P. vulgaris flowers can be combined with yeast and sugar and fermented into wine. The "language of flowers" is a tradition that assigns specific meanings or sentiments to various types of flowers. It began in the ancient Middle East and China and was introduced into Europe in the 18th century. The language of flowers became extremely popular in the Victorian era. According to this "language," primrose symbolize youth or young love, or mean "I can't live without you." Lilac-tinted primroses signify confidence and red primroses symbolize unappreciated merit. "A Modern Herbal"; Mrs. M. Grieve, 1931. Literature Network: John Donne: "The Primrose"
Poetry Connection: Samuel Coleridge: "To a Primrose"